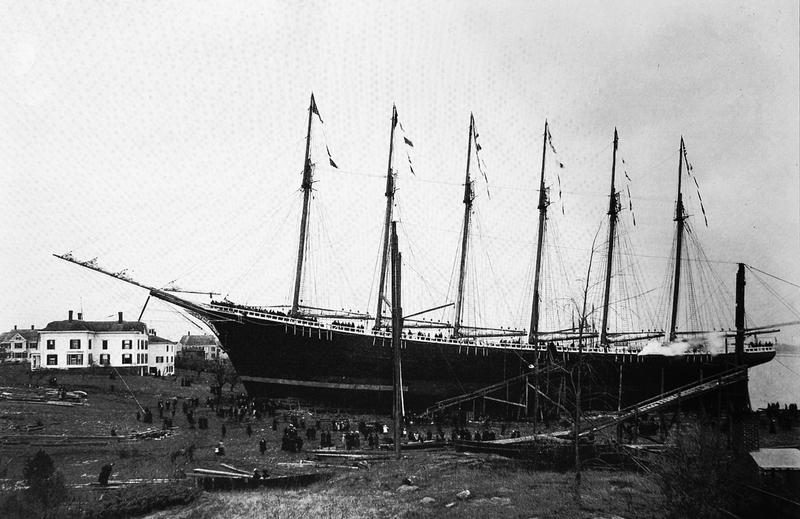 On Wednesday December 15 ,1909 the largest wooden sailing vessel ever built, the six masted schooner Wyoming was Launched at the Percy and Small shipyard in Bath, Maine. After approximately 14 years in service in the late evening hours of March 11, 1924 or during the early morning hours of March 12, 1924, in the vicinity of Pollock Rip Channel, a terrible winter storm destroyed the Wyoming and her entire crew. The Wyoming's final voyage departed from Boston, MA bound for Norfolk, VA. She would be loaded with coal to be delivered to Canada. Leaving Norfolk, she headed north, sailing between Martha's Vineyard and Cape Cod , and then through the Pollock Rip Channel. There are many books and articles written about the schooner Wyoming. During my research, I did not find any sources that provided information about who was on the ship when it went down, in a blizzard, in March of 1924. The Coast Guard cutters Acushnet & Tampa, who had been ordered to assist in recovery, were unable to locate any of the missing crew members. Many newspapers of that time period had conflicting lists of the crew members. In this web site I will present the information I uncovered and how I arrived at what I think is the most accurate account of who was on the Wyoming when it went down. There is one problem with this list that I will explain later. The crew that sailed from Boston to Norfolk, Virginia was different than the crew that sailed out of Norfolk to its doom. This is why the newspapers in the Boston area did not have accurate listings. My interest in this effort was because my father Soren Mark Pedersen was part of the crew of the Wyoming on the voyage from Boston to Norfolk. His many repeated stories of this trip provided some information, but lead to many questions that I did not think to ask before he passed away. This web site will include documentation that tells what happened following the first indication of a disaster involving the Wyoming, and a letter by Captain Glaesel that provides information of an incident on board the Wyoming in Boston, just prior to its voyage to Norfolk. This was a premature loss of a crew member on the Wyoming before it sailed out of Boston. My goal when I started this project was to answer 3 questions. 1. Who was actually on the Wyoming when it sank ? 2. Who replaced my father in Norfolk ? 3. Was my father’s story on how he left the ship in Norfolk, the only story ?